I broke the rules yesterday morning and checked Facebook before I even got out of bed. The result was seeing a post sharing an article with the above quote as a title. I was angry before I read it, furious by the time I finished. I kinda know what I’m talking about here, and exercise is, for me, and many others, integral to weight loss. It’s not the only factor, but it’s a major one-maybe equal to diet in my case. For those who haven’t followed my saga from when I started sharing in 2010 (though it started in earnest in 2003! ), here’s a recap, as concise as I can make it. I have PCOS, and around age 18, that, along with a fast food lifestyle, made me gain a lot of weight. Back then I had no muscle to speak of because I just didn’t do exercise. 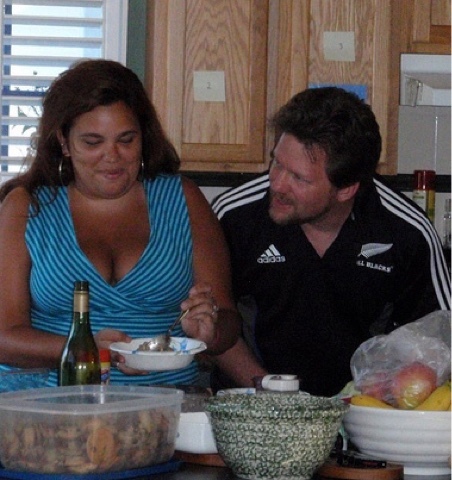 About 9 mos after I got married (February 2003) I decided I was going to lose some weight. I had some old 80’s workout vhs tapes that were discarded from the library, and for the first few months, I used those and a low carb cookbook/plan to help me lose weight. I was 20 years old, and it worked great. I also traded in the VHS for Pilates DVDs and a YMCA membership(I did an hour of cardio and lifted light weights 5x a week) after a few months and losing about 30 lbs. I remember my goal weight being 125, and the lowest I got to was 154. I was still about a size 10, but I was much fitter and my PCOS symptoms were improved. During this time I also discovered I could eat a whole pizza after working out and still lose weight. Then I stopped working out, kept eating the pizza. Whoops. By February 2005 I was Bigger than before and fed up. The day I joined a gym was also the day my brother in law announced his engagement to a beautiful girl in CA and the wedding was in 3 mos. perfect timing and motivation. I worked out twice a day, 6 days a week, and ate carefully (I have no memory of what I ate except that wine was dessert. Haha! )I lost 30 lbs and got down to a size 8 in those 3 mos. I looked cute and was the fittest I’d ever been. Then the wedding was over and my drive was gone. By 2007 I was even bigger than before. I started an online fit club for my new podcasting friends in late 07-early 08, but, despite losing about 10 lbs, I didn’t stick with it well or long. By August 2009 I was at my biggest ever (220 lbs, size 18) and despite resolving to do better, and achieving small amounts of success (below is what I use as my “before” picture and it’s actually AFTER I had slimmed down a little), nothing was really changing long term. me awhile in 2011 to find my exercise groove, and the weight took ages it seemed, to start coming off. I had a lot of crap to reverse. The first type of exercise I fell in love with was swimming, and I got up at 530AM to do it for months. I also found some Jillian DVDs and did them. Then, something inspired me to start going to the gym, and THAT is when my body started changing and my inner athlete showed her face for real. I discovered cycle and yoga and created a 17hr a week training program (Hahahaha) that got me the smallest (though not lightest) and definitely the fittest I’d ever been since I got married. Just in time to discover I was finally pregnant with Lexi. I lost 42 lbs and went from an 18 to a 10 that year. I did not track my calories, I just made wise food choices and indulged when I wanted. Then, after Lexi, I was back up to a 16 immediately postpartum, and I wasn’t prepared for the HUNGER that came with breastfeeding. I gained about 25 lbs in the first 6 mos-some of which i attribute to the meds I was on for anxiety, but that’s another story. In February/March 2013 we did a Whole30 and stayed 80/20 Paleo for awhile. I also started Jillian’s Body Revolution for the first time around then. 30 min a day? I could do that, even with a baby. But, I have an addictive personality and, I mean, I’d been training 17h a week before, so when results weren’t coming fast and I was crying because the level 2 workouts were so hard, i needed MORE, right? In August (13 mos after Lexi was born) I was doing 3 DVDs and cycle class and walking, and eating about 1600 calories a day and getting NOWHERE. Then a friend or two suggested that a) it was because I was breastfeeding, and B) I wasn’t eating enough to sustain that and all the exercise. Oh my stars was this hard to swallow. Eat more to lose weight? This cannot be. Also, it was suggested by many (including Jillian herself indirectly via her podcast) that I was overtraining. So I stripped down my program and ate more. I was doing BR, a light walk, and two cycle classes, for a total of 4h of hard exercise and 4-6 walks a week. I tracked my calories and ATE BACK most of what I burned in exercise to leave myself with (at first, at 180 lbs)) 1600 a day, and reduced by 50 each time I lost 5 lbs. between August and Late November I went down from a 12 to an 8, and lost 15 lbs. I ate cheesecake on days it was in my calorie budget, I drank wine, I ate whatever I wanted, then, I kept going with this formula, and in the next 3 mos I lost another 10 lbs and 2 more pant sizes. I was a FOUR! By the time I got pregnant with Declan in June 2014 I had reached my lowest weight since I was 18-150, and was the size I was when I was 13 in middle school. All while eating whatever I wanted (mostly clean, but also cheesecake and sushi and fried food). 70 lbs, size 18-4. Sticking to my formula though, and I’m getting stronger, and recently I’ve started to see changes in my body. Muscle definition, a smaller tummy, a smaller face. Consistent exercise. Not to mention exercise has kept me off anxiety meds, and kept me moving through the past year of postpartum depression and anxiety hell. I read that article and this is what I thought: this is to coddle those people who don’t like to exercise or don’t like to exercise hard. Those people will feel vindicated and say “see, it doesn’t help, so I don’t have to bother.” Meanwhile it insults those of us who have found success and life change and so much more in fitness. One of the commenters referred to people in the fitness industry as Snake Oil Salesmen. That’s just nonsense.